It turns out we’d both experienced a crisis moment with our health that had forced us to make self-care more of a priority. This got me thinking and reflecting, once again, on the topic of self-care. In my experience in supporting women for over a decade now to be at their best, one of the areas many of us struggle with is to prioritise our health and wellbeing. Can you relate to this? It often takes a life defining moment to make it at priority. Maybe it’s losing a loved one. Maybe it’s burning out or getting scarily close to it. Or maybe it’s a health scare. Whatever the reason, it often takes us to experience these extreme circumstances before we can give ourselves permission to prioritise it. I’m not sure if it’s our culture but somehow too many of us get caught up in the idea that self-care is self-indulgent or even selfish. Maybe we’re conditioned to believe that putting everything and everyone before ourselves is noble. That self-sacrifice is a measure of how good a person, and mother, we are. I know this was the trap I got stuck in. And it took me to experience chronic illness before I could reassess this. I had to scare the crap out of myself before the pain of not looking after myself properly, was more than the pain of thinking I was selfish for doing so! This is a story that I hear from so many women. That we tend to have to reach breaking point before we can properly listen to our body and give it the respect it deserves. I feel really strongly that this has to stop for us women, especially us mums. I feel like we’re at a time in history when the world needs us women more than ever. But, as Karen Brody brilliantly says in her book Daring to Rest, it needs the well-rested version of us. Not the exhausted version. I kind of like that. I’m finally moving from a place of feeling like I need permission to prioritise my self-care. For feeling like I need to justify to others the reason why I prioritise my self-care. I like the idea of rebelling against the norm of it feeling self-indulgent. But if like me, it may take you a while to get to that place, in the meantime I offer you this permission slip. 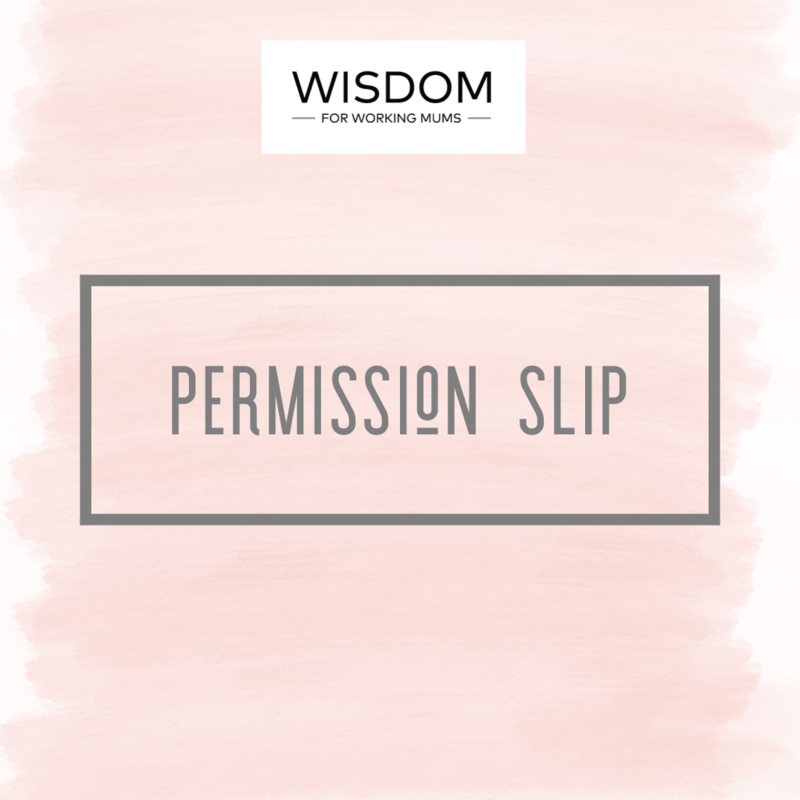 Earlier this week I shared this permission slip with the members of The Wisdom For Working Mums’ Village – my private group on Facebook. We do a ‘Self-Care Sunday’ post every week encouraging each other and sharing ideas on self-care. Hopefully you don’t need anyone else to give you this permission. But if like me, and many other women out there, you do, I hope this helps. Maybe we can start a self-care revolution where we rebel against the stigma of it being self-indulgent. I’ve always kind of liked the idea of being a rebel, but I used to be too compliant to be one. Do you fancy joining me? We’re genuine, like-minded women, just like you! We’re a community, reinventing how we combine work and motherhood without sacrificing our sanity and wellbeing.